I enjoyed the chipotle butternut squash so much that I just had to make it again! This time I turned it into a main from side dish by making it in the form of a burrito bowl where a burrito bowl is essentially a burrito served in a bowl rather than in a tortilla. I constructed this chipotle butternut squash burrito bowl with cilantro lime rice , seasoned black beans , pico de gallo , avocado, cheese and a dollop of sour cream. Overall this is one nice and simple meal that is full of flavour and even on the healthier side made more so by the use of brown rice in the cilantro lime rice . One of the things that I like about burrito bowls is that you can do pretty much whatever you want with them. They are a great way to use up some of those Mexican leftovers and they are definitely worth making extras to ensure that you have leftovers. You can make them as simple or as complex as you like. If you want things to be easier just go with rice and black beans instead of the cilantro lime rice and seasoned black beans and use a jar of your favourite salsa instead of the pico de gallo . If you want to put some more effort into it make some guacamole instead of just using diced avocado. 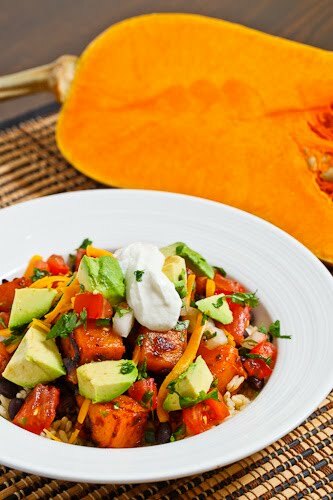 No matter how you do it, these chipotle butternut squash and black bean burrito bowls will be a hit! That looks so colorful and appetizing! A great and flavorful combo. This sounds great! New to your blog and enjoyed my tour! I love colorful and flavorful dishes like this! It's been far too long since I visited you here!! That is pure yummy in a bowl Kevin. Yum! The combination of the sweet/spicy squash with the creamy avocado and other fixings sounds great! I think I'll try this as a weeknight meal soon. I could totally eat this right now (9:49 pm here). Not a lot has been looking appetizing to newly pregnant tummy lately, but this looks yummy and nutritious. Butternut squash and avocado are two of my very favorite foods, but I never thought to pair them together like this in a Mexican meal. YUM. I don't usually eat rice, but I think I'm going to make this without the rice as a side dish! Wish I had it right now. In the midst of a couple weeks of mardi gras food and now St. Patrick's Day, Mexican is realllly sounding fabulous. this looks delicious, I am obsessed with burittos! Never thought to include sweet potatoe thou! Such a wonderful recipe. Have to try it. Love your recipes! You have a great array of vegetarian options which I enjoy exploring. I am new to blogging and it is a great inspiration for me to see blogs like yours!! The chipotle butternut squash is delicious. I made burritos instead of burrito bowls and they were a big hit! Just made this for lunch today & it was definitely as good as it sounded! DElish!! 🙂 Thanks!